“The entrance to the house was through a room which had just been built, and which was intended to answer the double purpose of an anti-chamber and a dining-room. This apartment led to another, which was made the drawing-room; beyond this was a third room running in a cross direction and very dark. This was intended to be the depository of the Emperor’s maps and books; but it was afterwards converted into the dining-room. The Emperor’s chamber opened into this apartment on the right-hand side. This chamber was divided into two equal parts, forming the Emperor’s cabinet and sleeping-room; a little external gallery served for a bathing-room. Opposite the Emperor’s chamber, at the other extremity of the building, were the apartments of Madame de Montholon, her husband, and her son, which have since been used as the Emperor’s library. Detached from this part of the house, was a little square room on the ground-floor contiguous to the kitchen, which was assigned to me. My son was obliged to enter his room through a trap-door and by the help of a ladder; it was nothing but a loft and scarcely afforded room for his bed. Our windows and beds were without curtains. The few articles of furniture which were in our apartments had evidently been obtained from the inhabitants of the island, who doubtless readily seized the opportunity of disposing of them to advantage for the sake of supplying themselves with better”. 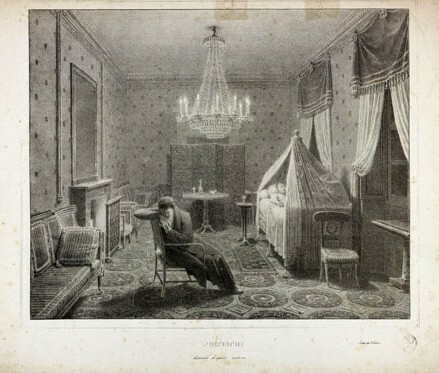 This lithograph is a reproduction of a drawing by Napoleon’s valet Louis-Joseph-Narcisse Marchand (Paris, 1791 – Trouville-sur-Mer, 1876), and is discreetly titled “interior” almost certainly due to the censorship that befell anything associated with the name of Napoleon during the Restoration. The faithful servant has represented himself mourning his master in the very salon that he knew so well. The emotional power of the scene as well as its attention to detail gives the spectator a strong feeling of proximity to the actual scene. Indeed it was included in the introduction of the album of lithographs by Adam, Arnoult et Bichebois, “Retour en France des dépouilles mortelles de Napoléon” (The return of Napoleon’s mortal remains to France), published in 1840.